I was searching for the good Garam Masala recipe from long back and found this recipe with one of my aunts Sheela. 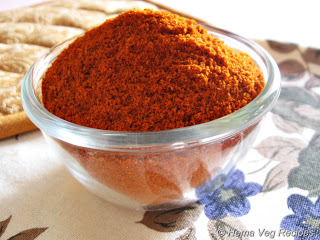 One day I had been to her house and she prepared Vegetable Cutlet using this Garam Masala Powder and the aroma was spreading all around her house. I was quite impressed, asked the recipe from her and prepared the Garam Masala myself. 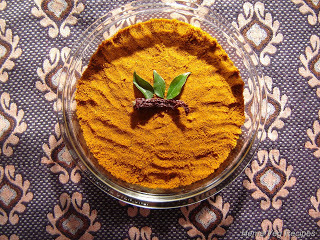 This Garam Masala can be used for North Indian Curries, Pulao, Sambar prepared for Idlies and Cutlets of course. It gives good aroma and taste to the dish prepared. As instructed below, dry roast all the ingredients separately, grind it into smooth powder and store it in an airtight container. Garam Masala Powder can be stored and used for more than 6 months. Just add 1/4 tsp of this Garam Masala to any dish you prepare. I have not used Red Chillies for this powder and hence add the Red Chilli Powder to the curries and for the other dish preparations. For Pulao, one usually goes for Green Chillies; along with these Green Chillies use 1/4 tsp of Garam Masala to give more taste. 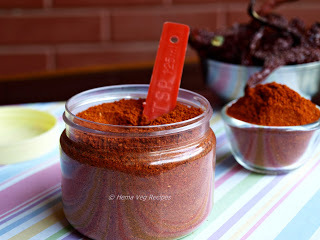 Hope your preparation turn out to be tastier with this home made Garam Masala as has been my experience. Heat the frying pan and dry roast the above listed ingredients seperately (one and only one at a time) until you obtain good aroma of fried ingredient. Transfer the dry roasted ingredients to a plate and allow it to cool completely. Once cooled down, transfer these ingredients to a mixer grinder and grind to a smooth powder. The Garam Masala is ready! Cool the Garam Masala Powder for few minutes before transferring to an airtight container. While grinding the Cinnamon, Star Anise and Clove in a mixer grinder, for each of these ingredients, use whipper first to grind them into coarse powder and then use grinding levels provided 1,2,3 in your mixer grinder to powder it. Cinnamon, Star Anise and Clove are too hard to crush, so it is better to churn first before grinding to a smooth powder. 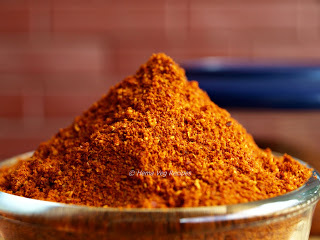 In this Garam Masala Powder I have not used Red Chillies, so add Red Chilli Powder to the preparations (eg: Curries, Cutlets etc.,) along with Garam Masala. Unlike the ready-made Garam Masala you get in the departmental stores, Garam Masala prepared using above method is quite strong/concentrated and hence use only 1/4 tsp to the recipe one try. This much is enough to give good aroma and taste to the dish. Do not use the regular cup to measure the above ingredients. Use smaller cups (like the coffee cups) to measure the ingredients. This helps to avoid producing Garam Masala in bigger quantity than needed. Keeping the powder for a long duration will reduce the aroma of the Garam Masala. So better to measure in small cups to obtain the right quanity of Garam Masala. Always cool the above ingredients completely after roasting and before grinding; else lumps may be formed when grinding into powder. If so desired, measurements of the Cloves, Cinnamon, Cardamom and Star Anise can be reduced to some extent. Nothing to beat homemade spice powder right ? good one ! 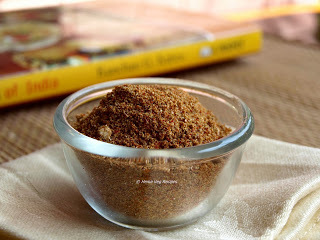 I wanted this recipe.. this is most easy method to prepare Garam Masala, I ever found. Please post khajur halwa making to enjoy this Diwali. Khajur Ka Halwa is already posted. Pls have a look here. Enjoy your Diwali.